*Standard Oil Change includes up to 6 quarts of Dexos Full Synthetic oil. Excludes Volkswagens and Volvos, and other models that require alternative synthetic oils. We have a tire price match guarantee and a large selection of tires in stock. 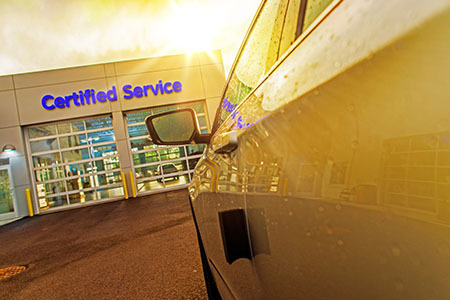 We also offer Lifetime tire rotations, Tire Repairs, and Brake Inspections when purchasing tires from us. Regular rotations and alignments protect your tires from uneven wear, increase fuel efficiency and keep your ride smooth. If your tires or wheels are in need of an adjustment, we will get them back on the straight and narrow. If something seems to be wrong with your tires, your first instinct may be to replace them right away. Since frequent tire purchases can get expensive over time, it is important to understand your options when it comes to tire repair and service. One common problem that people have with their tires is a puncture or tear after running over something sharp (like a nail) in the road. If the puncture is located in the tire tread and fixable, it is a good idea to see a professional. While tire plug kits are available, research has shown that many of these do-it-yourself repairs are done incorrectly and do not solve the problem, still leaving your tires and vehicle vulnerable to danger. With its straightforward construction of polyester, steel, and rubber, our tires are designed to take us where we want to go, and last for tens of thousands of miles. However, this durability is not a guarantee without the right care and maintenance in place. Unfortunately, many drivers neglect proper tire maintenance and care. According to different reports, we do not give our tires enough attention and more than a quarter of passenger vehicles have incredibly underinflated tires. When you combine this with the normal wear and tear of daily driving, our tires may be missing the mark in terms of fuel efficiency, vehicle performance, and overall safety. We perform brake work on all makes and models and are competitively priced. Starting with brake pad replacement at $99.95. We offer free lifetime brake inspections when brakes are purchased from us.